Advanced Office has been Ontario's specialist in document management and printing solutions for the last 30 years. 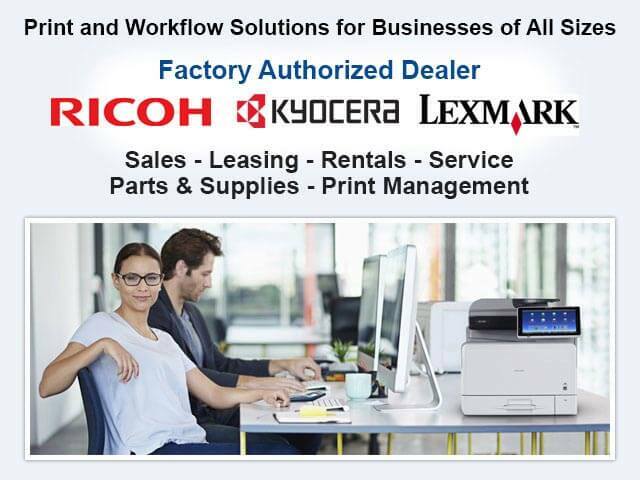 We're fully authorized to sell, lease, and rent Ricoh and Lexmark products. We offer their complete line of copiers, printers, digital duplicators, wide-format devices, production printers, and fax machines. We also sell certified refurbished printers and copiers that come off our short-term leases. While Ontario businesses may have many dealers to choose from, Advanced Office is the only dealer that also offers personalized service; factory-certified installation, service, and maintenance; a guaranteed four-hour average response time; fully stocked service vehicles; local dispatch; access to over $1 million in OEM parts; on-going product training; and custom software development. When you combine our value-added services with our competitive pricing, Advanced Office undoubtedly offers Ontario businesses the best value in print and workflow solutions. Call today to schedule a free professional onsite analysis and discover why more than 30,000 Southern California businesses have made Advanced Office their copier/printer dealer of choice. 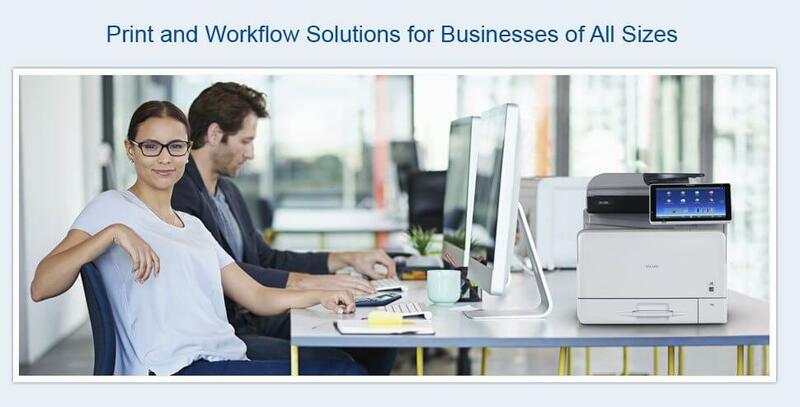 Because printing, copying, and scanning is so integral to today's business environments and printing costs can account for a significant percentage of a company's expenses, having a reliable and cost-efficient copier can make a huge difference in overall revenue. Copiers vary greatly in terms of production capabilities, print quality, speed, features, network integration, and price, so determining which copier will be best for your business can appear daunting. That's why working with an experienced copier dealer is so important. At Advanced Office, our job is to help you make the best possible copier decision for your Ontario company. By administering a complete workflow analysis that consists of evaluating your current office equipment, interviewing your key users, and understanding how your office operates, our sales consultant will be able to recommend one or more copier models that will meet your needs and fit your budget. We've helped thousands of businesses throughout the Inland Empire, Los Angeles, Orange County, and San Diego find the best copier for their needs and we know we can help you. Advanced Office proudly sells, leases, and rents Ricoh and Lexmark copiers. 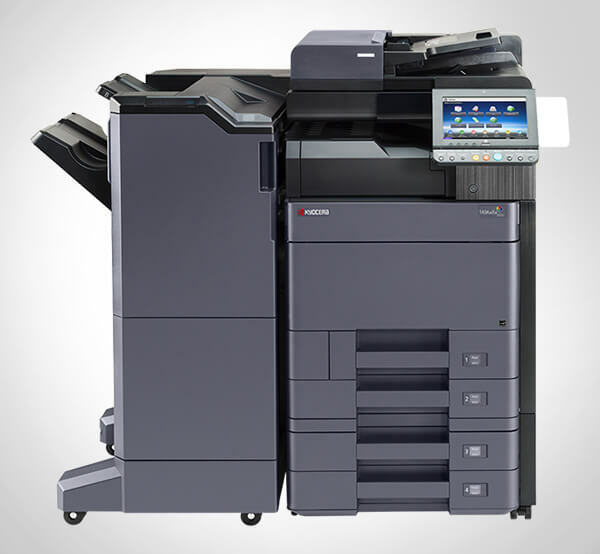 Their all-in-one copiers come in a variety of sizes and usually include print, scan, copy, and fax capabilities. They can usually print in both black and white and color, and sometimes offer finishing options, such as hole punching, stapling, booklet finishing, folding, and ring binding. Additionally, these copiers often come standard with a number of security features and can have special software uploaded for added security or automation. We offer new and certified refurbished copiers. Call today to speak with one of our copier sales consultants. We'll come out to your Ontario business site and provide honest, professional advice and expert product recommendations. Over the last three decades, Advanced Office has provided Ontario businesses of all sizes with high-quality single-function and multifunction printers. Both Ricoh and Lexmark are known for producing printers that lead the industry when it comes to innovation and quality. In fact, year after year, their printers win Pick of the Year or other outstanding achievement awards from Buyers Laboratory Inc. (BLI), the leading independent provider of analytical information and services to the digital imaging and document management industry. By investing in a Ricoh or Lexmark printer, you'll benefit from faster printing speeds, reduced printing costs, and greater durability in high-production environments. Single-function and multifunction printers can print in color, black and white, or both. Optional features include high-capacity paper trays, duplexing, specialized software (to facilitate workflow routing, desktop integration, security, etc. ), and more. If you are interested in a printer or a fleet of printers for your Ontario business, call Advanced Office today. We'll come out to your worksite and help you determine the best brand and model for your needs. We'll also walk you through all of our purchasing, leasing, and rental options. Ricoh's digital duplicators offer Ontario area schools, universities, nonprofits, and commercial businesses a highly cost-effective way to produce large quantities of single-page flyers, documents, and forms. Unlike laser or inkjet printers and copiers, these machines create black and white copies using a stencil and ink from a spinning drum. This gives digital duplicators the advantage in terms of print speed and cost per page when it comes to making large numbers of copies of one-sided, single documents. Call today to learn more. Production printers are often used by our Ontario clients who are looking to create their own print shop. 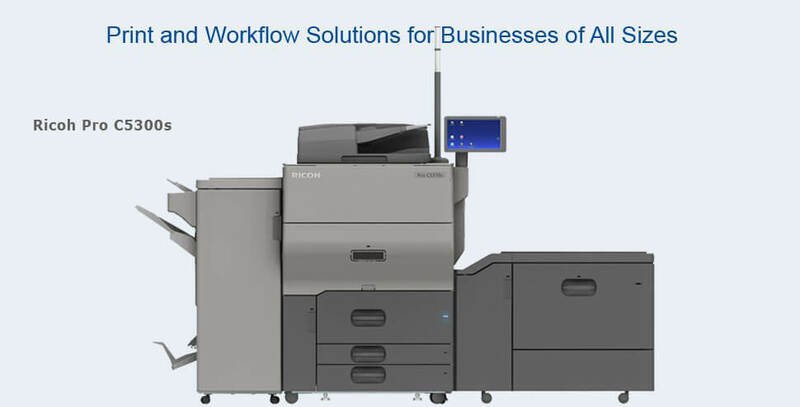 By buying, leasing, or renting a Ricoh production printer, businesses can produce large quantities of high-resolution prints quickly, conveniently, and cost-effectively. Our line of production printers all feature extremely durable components and a variety of finishing options. Choose from light, medium or heavy production printers that can be installed with custom print and document management software. Call today to work with one of our consultants. Our consultants are experts in helping businesses determine the best production printer model and financing option for their printing needs. 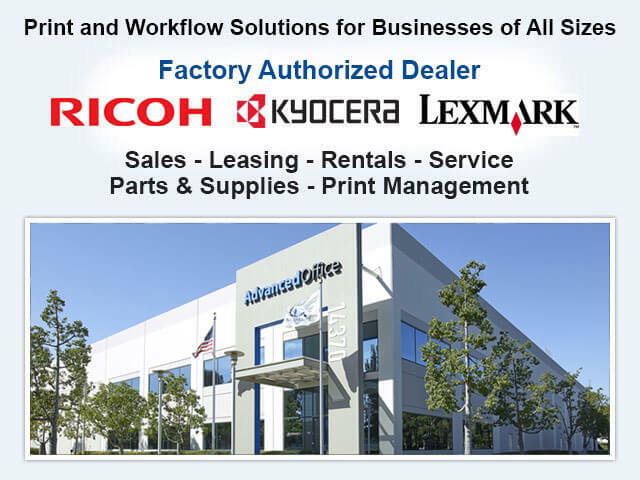 Advanced Office is factory trained and authorized to sell, lease, install and service Ricoh wide-format printers. Wide-format printers are ideal for engineers, builders, contractors, architects, and other businesses in Ontario that need in-house capabilities to copy, print, and scan oversized documents (up to 3 feet in width and 49 feet in length), such as large schematics, drawings, and posters. Ricoh's wide-format printers are renowned for producing prints with excellent resolution in a very short amount of time. Call Advanced Office for a free analysis and estimate; we can arrange for 100% financing with low interest rates that include the cost of the equipment, a service agreement, and software. For all of your printer and copier needs in Ontario, call Advanced Office. We have a dedicated team of sales consultants, product trainers, service technicians, and IT experts who are all highly trained and experienced and readily available to provide you with world-call service and support. Our consultants are well-versed in workflow optimization and thoroughly trained on all of Ricoh and Lexmark products. They can be trusted to help you find the best printer, copier or other office automation equipment for your needs. 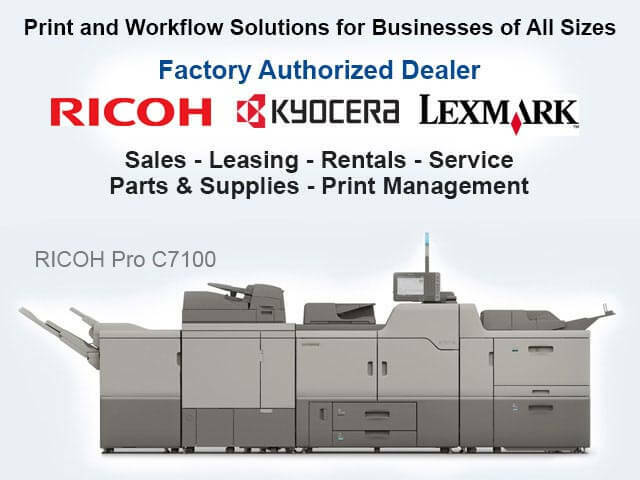 Advanced Office is an authorized dealer for Ricoh and Lexmark. We are fully insured and have thoroughly screened and background checked our employees. We're also members of the National Business Technology Association and the Select Dealer Group. Call today to schedule your free workflow analysis. By working with Advanced Office, you'll get access to the industry's best printers and copiers, competitive pricing, and dedicated, local service for your Ontario business. I am writing this letter to truly thank you so very much for all you have done for our company. We have worked with you for the last 3+ years. When I look back at making a decision on what company . . .